IUE fashion designers made their mark again at Europe’s largest bridal fair. 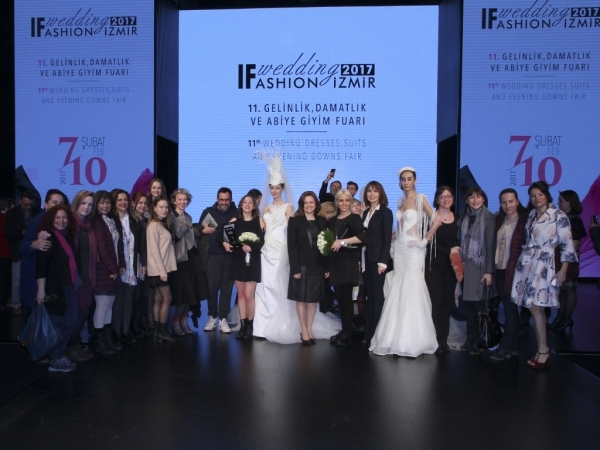 Ece Metiner and Fulya Civaroğlu, both graduates of IUE Faculty of Fine Arts and Design, Department of Fashion and Textile Design, respectively came in second and third place among 15 finalists at the 11th IF Wedding Fashion Izmir - Wedding Dresses, Suits, and Evening Gowns Fair. 120 fashion designers applied with 360 bridal designs to this year’s contest titled 'Zamansız (Timeless)'. 5 fashion designers, including Ayşenur Çavdar, Filiz Özbengi Uslu, Merve Gökesmer, from Izmir University of Economics among 15 finalists, represented the University at the contest. First among to celebrate the winners, Metiner and Civaroğlu, who came back from the 11th IF Wedding Fashion Izmir - Wedding Dresses, Suits, and Evening Gowns Fair with 2 awards, were the Rector Prof. Dr. Can Muğan, Prof. Dr. Ender Yazgan Bulgun, Dean of IUE Faculty of Fine Arts and Design, Prof. Dr. Elvan Özkavruk Adanır, Head of IUE Department of Fashion and Textile Design, and lecturers of the department. The fair was opened with the participation of Aziz Kocaoğlu, Mayor of Izmir Metropolitan Municipality, Sabri Ünlütürk, Coordinator-Chairman of Aegean Exporters' Association, Emre Kızılgüneşler, Chairman of Aegean Textile and Ready Wear Federation, Prof. Dr. Can Muğan, Rector of Izmir University of Economics, district mayors, and fashion designers. Tuğçe Görgülü, student at IUE Faculty of Fine Arts and Design, Department of Fashion and Textile Design, winner of last year, will also be displaying her designs under the collection titled “Düş Bahçesi (Dreamland)” on February 9 as part of the fair.